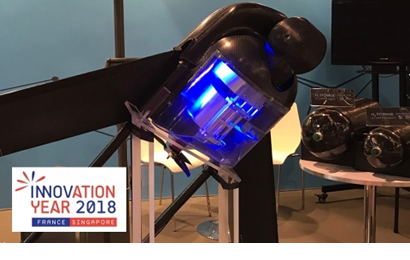 The FLY-HY alliance will officially make its debut at the 2018 Singapore Airshow at H3 Dynamics (booth C18), HES’ parent company. HES Energy Systems develops small-scale battery alternatives based on its special breed of ultra-light hydrogen fuel cell systems capable of storing energy at over 700Wh/kg, 3 to 4 times the electrical energy per weight of lithium batteries. “The hydrogen molecule is the lightest energy carrier in the universe. Meanwhile most of today’s electric aircraft research has been focused on work-arounds using much heavier lithium batteries. We see a clear opportunity to contribute to the exciting world of electric flight” said Taras Wankewycz, Founder & CEO of HES and parent company H3 Dynamics. Thinking big yet starting small, HES started out increasing the flight endurance of small electric powered unmanned aircraft (UAVs) or drones, using its special lightweight fuel cell and hydrogen storage technology. The company has been working closely with numerous tier-one electric-UAV manufacturers and believes a scaled-up version of its products could also improve the flight range for personal mobility aerial vehicles as well as electric-powered passenger aircraft. 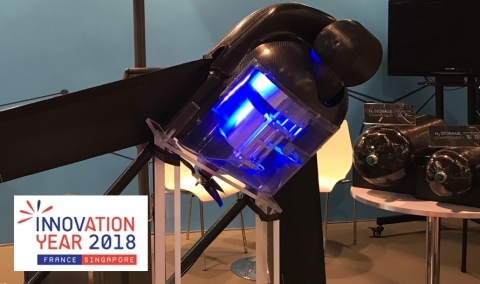 2018 was proclaimed by Singapore Prime Minister Lee Hsien Loong and Former French President François Hollande as the Year of Innovation between France and Singapore, highlighting Cleantech as one of the key focus areas. In June 2017, Singapore’s HES’s parent company H3 Dynamics established its European HQ in Paris, a decision warmly welcomed by President Emmanuel Macron and his government. After operating for some time locally in France, H3 Dynamics decided to combine its “Made in Singapore” aerospace-grade hydrogen fuel cell capability with complementary “Made in France” high tech solutions, including novel electric UAV platforms (Toulouse-based Airborne Concept, backed by Airbus), hydrogen gas storage devices (AD-VENTA), and innovative hydrogen generating electrolyzers (ERGOSUP, backed by Air Liquide) which is now adapting its innovative systems to refueling small HES-powered hydrogen drones. HES Energy Systems and ERGOSUP are also working in partnership with DELAIR, another French drone tech company, on project HYDRONE, a laureate of a French National Call for Projects “Territoires Hydrogène”. The national project aims to deploy five hydrogen drone and refueling systems capable of covering the entire French territory during 2018 and 2019. This initiative also follows the launch of the Hydrogen Council in 2017, involving a number of high-profile companies including Air Liquide, Alstom, AngloAmerican, BMW Group, Daimler, Engie, Honda, Hyundai, Shell, Linde, Total, Toyota, Audi, General Motors, Statoil & Iwatani, working together to promote a new hydrogen economy and society. HES Energy Systems is a global leader in developing ultralight fuel cells and hydrogen energy storage systems for aerospace and other weight sensitive applications. Hired by tier-one UAV manufacturers, and leading aerospace institutes around the world, the company uses a variety of hydrogen storage approaches, including gaseous compressed, chemical hydrides and reforming. HES was acquired in 2015 by H3 Dynamics Group, which is developing off-grid field robotics and AI-enabled data services. ERGOSUP has developed an innovative hydrogen production process based on zinc electrochemistry. Its first product is a 350 bar hydrogen generator supplying 1 to 5 kg of hydrogen per day. ERGOSUP is planning to launch a simple and cost competitive H2 generator capable of filling up “plug and play” composite cylinders, allowing hydrogen to be supplied for a single drone or a fleet. The company is backed by ALIAD (Air Liquide Venture Capital), DEMETER PARTNERS, GO CAPITAL and ARKEA Capital Investment. Airborne Concept is based in Toulouse and specializes in the design, development and construction of innovative drones. Two patented UAVs, the world’s first air-droppable drone and a VTOL are the pride of the Airborne Concept teams, made up of former flight crew members from the French Air Force and engineers graduated from aeronautical engineering schools. Airborne Concept is developing air-droppable drones for Special Forces and its Up-Start drone for parcel delivery. The company has also developed an ADS-B transponder for drones, an essential link in the identification of drones in the airspace. AD-VENTA specializes in on-board gaseous hydrogen systems (H2 Pressure and Flow Rate Regulation). With in-house factory design and realization, the compact, safe and accurate turnkey solutions proposed by AD-VENTA are based on a large patent portfolio and expertise in control of high pressure compressed gases. Its markets include automotive, light mobility, aerospace and naval applications. Aerial, Ground, Surface and Underwater Unmanned Vehicles powered with hydrogen fuel cells are its short-term development targets.